Can the U.S. Learn from Indian R&D? Hint: it’s all about developing your company’s most valuable asset. Why India Will Beat China: Transparency Wins! India will eventually outclass China because of its property rights, rule of law, and IP protection, says Nobrega. The Shock Doctrine – or how to use war and other disasters to make money for special interests like the oil lobby. See more on how this “state of extortion” technique plays in the aftermath of Katrina, or the wildfires in the west, or the use of conserved lands for agriculture. In some companies, you’ll hear senior executives spout this tired mantra: “Innovation is everyone’s job.” When that happens, head for the exit. Now, the British are going to tell us how to measure innovation. The National Endowment for Science, Technology & the Arts (NESTA), a nonprofit organization that promotes innovation, wants to create a new index, one that will be industry-specific… blah, blah, blah. I agree with their premise that traditional methods of measuring innovation, such as the amount of money thrown at R&D, don’t tell the entire story. But their idea of implementing an industry-based “peer review in which company executives both help to define the innovation indicators and rate each other” is a joke. Let’s see. Let’s ask the CEOs of Exxon, Chevron, Shell ,and BP to rate their industry on innovative approaches to solving the energy problem. Not funny, is it? Clayton Christensen says the same thing in this article about creating new value networks. So what should we measure? How about looking at results? Hey, at least the British are trying. Better than our lame Department of Commerce. BTW, BusinessWeek does have a Global Innovation Index worth looking at, but again, they’re looking at the establishment, the industry giants that are investing in innovation. What I want to see is the game-changers. Where’s the next successful car company coming from? Is it Tata or Tesla? The man is a living saint. I remember how mad I got at Reagan for declaring him a terrorist. 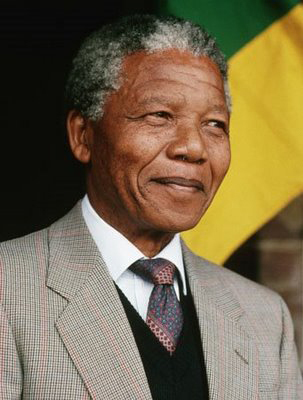 Mandela – the greatest freedom fighter ever. Happy Birthday – Prisoner 46664! Bill Gates’ greatest achievements lie ahead of him. And this time, he really is going to change the world. Why? Because he understands that there are some things that just can’t be done by business or the marketplace. So the voices of the poor are never heard in this marketplace system. That is, the needs of the poorest, they don’t speak in that prioritization, because they’re not paying for medicines. They can’t. So today’s prioritization is totally for the richest, for the things that they speak by buying those various medicines for. And so as we take our money, which in total is, compared to the overall market, fairly small, and cause some shift in the favor of malaria, AIDS, tuberculosis, to the degree there’s a finite number of scientists in the world, then you could say, OK, there’s a little bit less on baldness. Because our money is incremental, ideally you’d be growing the pool of scientists, because you have more money, more jobs, more opportunity there. But it is true that the needs of the very richest might get a tiny bit less attention as we cure tuberculosis. It’s refreshing to hear this from a leader of Gates’ caliber. Another point of note: Gates doesn’t want incremental innovation and since he knows the current model of medical research isn’t working, he’s ready to change it. There’s a lot more on this new version of Gates here, here, and here. What I like about it is the fact that Buffet is on board with him, and that between the two of them, they’re going to redefine the meaning of philanthropy. The Gates Foundation is focused, and rightly so, on health and development. But there’s just one thing they’ve forgotten: energy. As Bob Freling says, “Energy is a human right.” The point Freling makes every day is absolutely critical and one Gates needs to understand: “You can’t have X-rays, or crop irrigation, or vaccines, without electricity. And in places like Africa, the only effective way to get that electricity – when you’re off the grid – is solar power.” So the Gates Foundation is going to have to look at energy as well. And the sooner they do, the faster they’ll get there with their other objectives – food security, health care for the poorest of the poor, etc. I can’t wait to see more billionaires get on the Philanthropy 2.0 bandwagon. What are you waiting for Larry Ellison? And how ’bout getting A.G. Lafley and the P&G open innovation nerds on board as well. Let’s cure malaria instead of whitening teeth. eh? Many of these decisions were probably right at the time, and on their own merit would not have created the dilution of the experience; but in this case, the sum is much greater and, unfortunately, much more damaging than the individual pieces. For example, when we went to automatic espresso machines, we solved a major problem in terms of speed of service and efficiency. At the same time, we overlooked the fact that we would remove much of the romance and theatre that was in play with the use of the La Marzocca machines. This specific decision became even more damaging when the height of the machines, which are now in thousands of stores, blocked the visual sight line the customer previously had to watch the drink being made, and for the intimate experience with the barista. This, coupled with the need for fresh roasted coffee in every North America city and every international market, moved us toward the decision and the need for flavor locked packaging. Again, the right decision at the right time, and once again I believe we overlooked the cause and the affect of flavor lock in our stores. We achieved fresh roasted bagged coffee, but at what cost? The loss of aroma — perhaps the most powerful non-verbal signal we had in our stores; the loss of our people scooping fresh coffee from the bins and grinding it fresh in front of the customer, and once again stripping the store of tradition and our heritage? Then we moved to store design. Clearly we have had to streamline store design to gain efficiencies of scale and to make sure we had the ROI on sales to investment ratios that would satisfy the financial side of our business. However, one of the results has been stores that no longer have the soul of the past and reflect a chain of stores vs. the warm feeling of a neighborhood store. Some people even call our stores sterile, cookie cutter, no longer reflecting the passion our partners feel about our coffee. In fact, I am not sure people today even know we are roasting coffee. You certainly can’t get the message from being in our stores. The merchandise, more art than science, is far removed from being the merchant that I believe we can be and certainly at a minimum should support the foundation of our coffee heritage. Some stores don’t have coffee grinders, French presses from Bodum, or even coffee filters. Now that I have provided you with a list of some of the underlying issues that I believe we need to solve, let me say at the outset that we have all been part of these decisions. I take full responsibility myself, but we desperately need to look into the mirror and realize it’s time to get back to the core and make the changes necessary to evoke the heritage, the tradition, and the passion that we all have for the true Starbucks experience. While the current state of affairs for the most part is self induced, that has lead to competitors of all kinds, small and large coffee companies, fast food operators, and mom and pops, to position themselves in a way that creates awareness, trial and loyalty of people who previously have been Starbucks customers. This must be eradicated. I have said for 20 years that our success is not an entitlement and now it’s proving to be a reality. Let’s be smarter about how we are spending our time, money and resources. Let’s get back to the core. Push for innovation and do the things necessary to once again differentiate Starbucks from all others. We source and buy the highest quality coffee. We have built the most trusted brand in coffee in the world, and we have an enormous responsibility to both the people who have come before us and the 150,000 partners and their families who are relying on our stewardship. So is Starbucks really turning itself around by going back to its roots? Are you listening, Krispy Kreme? The Economist has just begun a series on “big ideas” in management thinking. These may be the buzzwords of the past, but many of them are worth understanding. My research suggests that companies fall prey to active inertia—responding to even the most disruptive market shifts by accelerating activities that succeeded in the past. When the world changes, organizations trapped in active inertia do more of the same. A little faster perhaps or tweaked at the margin, but basically the same old same old. Managers often equate inertia with inaction, like the tendency of a billiard ball at rest to remain immobile. But executives in failing companies unleash a flurry of initiatives—indeed they typically work more frenetically than their counterparts at competitors which adapt more effectively. Organizations trapped in active inertia resemble a car with its back wheels stuck in a rut. Managers step on the gas. Rather than escape the rut, they only dig themselves in deeper. Strategic frames: What we see when we look at the world, including definition of industry, relevant competitors and how to create value. Processes: How we do things around here entailing both informal and formal routines. Resources: Tangible and intangible assets that we control which help us compete, such as brand, technology, real estate, expertise, etc. Values: Beliefs that inspire, unify and identify us. So we just dig a deeper hole. How do we get out of the mess? It starts with a sense of urgency. By the way, this idea of active inertia applies at the individual level as well. How many of us go through life doing the same thing over and over?